I don’t have any Creole or Cajun relatives (that I know of), so for authentic recipes I turn to some of my favorite cookbooks. Emeril calls this particular recipe his “Clean Out the Ice Box and Freezer” Jambalaya, my kind of food, particularly now because after the holidays and fall harvest we have a freezer stuffed full of…stuff. After going through it a week ago we renewed our commitment to using up some of the stash and cleaning it out over the next month, which will of course make room for more stuff. The cycle never ends. The recipe is pretty straight forward, but I made a few modifications as a I went. First of all, I couldn’t believe it had no celery and I added some anyway. The recipe calls for a mix of dark and white meat, but since Michael doesn’t care for dark meat I used only white meat. I also used brown rice instead of white rice and reduced the oil to 1/3 cup. Not much of a difference in the amount of oil, I know, but I think the recipe turned out just fine. And because this was dinner for all of us, I cut back on the cayenne so the boys could enjoy it too. Michael made up for the lack of heat by pouring some hot sauce onto his servings. This is an easy dish to prepare, and it’s practically a meal in a pot. Add a green salad or other green vegetable and you are set. Like many recipes calling for meat, this one has weight measurements, which are more precise than measuring by cups (i.e. 3 cups of sliced sausage). We buy frozen shrimp in two pounds bags then just weight out what we need each time. A kitchen scale is a handy piece of gear for weighing all kinds of ingredients for cooking and baking. I use mine all the time for weighing meat, vegetables, fruits, flour, nuts, just about anything. For this week’s celebration of the third anniversary of Andrea’s Recipes, I’m giving away a kitchen scale courtesy of Eat Smart. The scale has a digital display and weighs in both grams/kilos and ounces/pounds and allows you to change them on the fly. It has a simple tare function so you can put a bowl on the scale then turn it on, and the scale will register zero, giving you accurate measurement for the ingredients you add to the bowl. It’s small enough that it won’t take up much space in your kitchen, but sturdy enough to handle up to 11 pounds. To enter the contest just leave a comment telling us about your favorite meal that helps you clean out your freezer or refrigerator. Please make sure your email address is correct so I can contact you if you are the lucky winner. The scale can be shipped to United States addresses. The contest closes at midnight EST on Wednesday January 22, 2009, and Random.org will select the winner. Look for the announcement of the winner in this post soon after. UPDATE: Congratulations to Nicole, comment #6, the winner of the kitchen scale! Adapted from New New Orleans Cooking, by Emeril Lagasse and Jessie Tirsch. Heat the oil in a large cast-iron Dutch oven over medium heat. Add the sausage and cook until it start to render the fat. Add the onions, bell peppers, 1 teaspoon of the salt, the Creole seasoning, and 1/2 teaspoon of the cayenne. Stirring often, brown the vegetables and sausage until they are caramelized, about 15 minutes. Scrape the bottom and sides of the pot to loosen any browned particles (fond). Add the garlic and cook for 1 minute. Season the chicken with the remaining 1 teaspoon salt and remaining 1/2 teaspoon cayenne. Add the chicken, ham, and the bay leaves to the pot. Brown the chicken for 8 minutes, scraping the bottom of the pot to loosen any browned bits. Add the rice and stir for 2 to 3 minutes to coat evenly. Add the water, stir to combine, and cover. Cook over medium heat for 30 to 35 minutes, without stirring, or until the rice is tender and the liquid has been absorbed. Lay the shrimp on top of the cooked rice during the last 5 minutes of cooking and steam until just pink. Remove the pot from the heat and let stand, covered, for 2 to 3 minutes. Remove the bay leaves. Stir in the green onions and parsley, and serve. ahhha! I’ve been waiting for this one! and it’s good to see I can make this with brown rice. fits very nicely into phase 2 of the SBD! I’ll let you know how it tasted! Hugs! Oh my that jumbalaya looks soooooo good. My go-to meal when it’s time to clean out the fridge/freezer is pot pie. Usually it’s vegetables that have reached the elderly stage of their life cycle in either place, & always that pack of frozen meat in the bottom of the chest freezer. Since I usually only have beef, pork or chicken, they always make the best pot pies. 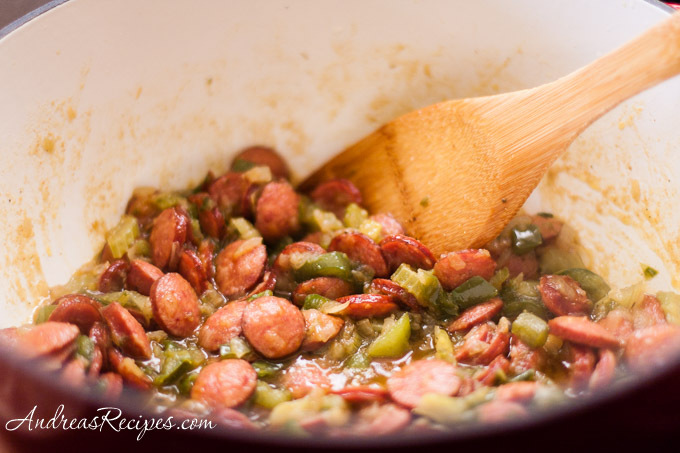 Jeez, talk about timing… Just this past weekend, we started putting a Mardi Gras party together and one of the suggested dishes was Jambalaya, Guess I know what I’ll be making!!! Now as for emptying fridge/freezer, I just start cooking whatever’s there and invite friends in to eat the results. They get a free meal and I get an empty fridge & freezer to start stockpiling again. It’s a win, win situation. My clean out the fridge/pantry meal is soup. A little packaged chicken broth, some leftover meat and veggies, that half cup of pasta that isn’t enough for a meal on it’s own and voila! Dinner is served. my clean out the fridge freezer meals is stir fry. any meat or frozen or fresh veggie goes in there. the jambalaya looks great! Mmm. I liked to use up odds and ends either by tossing them all into a pot-pie or tossing them all around with some pasta. My clean out the fridge meal is stir-fry. I just throw in whatever leftover veggies and meats I have with some rice. Works everytime! This jambalya looks wonderful! I just got a dutchoven and am anxious to try it out on this dish! That looks soo good! It’s funny that you should make this because a few weeks ago I made a big pot of Jambalaya. I would have gotten stuck at the celery part in the recipe too. Just like the French have the mirepoix of 1 part carrot, 1 part celery, and 2 parts onion, in Creole the have the trinity of equal parts onion, pepper, and celery. 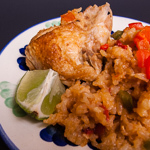 A Jambalaya recipe without celery is just… wrong! As for my favorite clean-out-the-refrigerator meal, I would have to say it’s something as simple and straightforward as soup or stew. There are so many different styles that anything can work and it can be adapted to endless styles and endless menus. Almost any soup is a good way to clear the fridge, and casseroles can also be useful. I also like to use smaller amounts of leftover cooked vegetables and meat on homemade pizzas, frittatas, or quiches. My favorite foods are from south Louisiana and many of the recipes are good for cleaning out the fridge. I love to make jambalaya and gumbo with whatever happens to be lurking behind the milk. That looks great, Andrea. My favorite cleaning out the fridge recipe is soup. A little of this, a little of that, add some broth and you have dinner. I usually fix soup, a pasta dish fried rice dish or stir fry. The best way to clear out some space in my freezer is to make chicken stock. I always throw leftover chicken bones and veggies in the freezer, and when I run out of room, it’s time to make stock! I actually have 2 recipes that help me clean out the frig. First soup. I like making soups and you can make a tasty soup with any protein and veggies. The other recipe is quiche. You would be amazed what you can put in a quiche and it takes really good. Thanks for the giveaway!!! 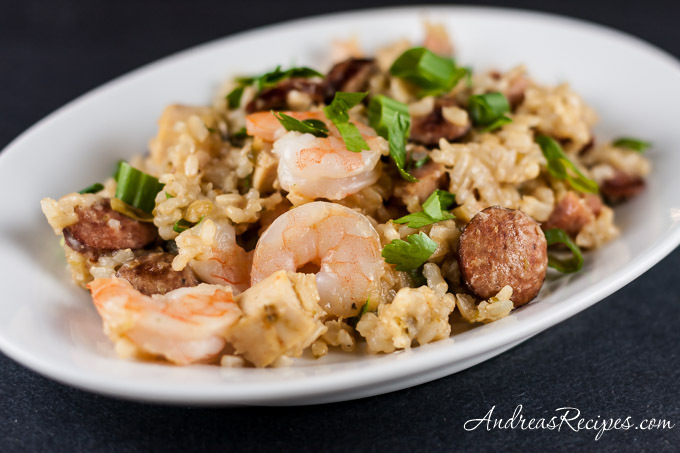 Andrea, I was just drooling at a jambalaya recipe today! Cause of course, I love to read cookbooks in my down time. Anyways, my clean-out-the-freezer recipe is usually soup — since I store my beef stock in there and have lots of frozen veggies, if I need space and am feeling lazy I’ll make soup with quinoa, beef broth, and vegetables. Mmmm. Great idea! I usually clean out the freezer by making a whole meal out of several frozen leftovers. For example leftover frozen lasagna + frozen chicken soup. Or frozen hot dogs + frozen buns + frozen chili (or sauerkraut). Those leftovers really start to take up space! Looks great, and I love the healthier changes that you made. A clean out the fridge recipe… soup of course! This looks like a great recipe. I love jambalaya. My clean out the fridge/freezer is usually a pot of soup/stew depending on what I find to put in it. I love to make big batches of soup and put in everything but the kitchen sink! I don’t keep anything in the freezer that’s in the side by side that needs to be cleaned out, it’s for stuff we constantly use. I don’t clean out the chest freezer nearly enough. When I do I don’t make one meal I’ll just spend a day throwing away or cooking a bunch of things. I can taste it already … planning on making this on Saturday to warm up a cold Michigan winter. Mine is definitely the big ole stir fry all the leftover vege’s in a pan with a little meat of whatever’s left in along with it. Thanks for the opportunity. I always seem to have frozen chicken, so I usually make a chicken and rice dish and toss in whatever frozen veggies turn up. I have been meaning to get a scale for some time now. Suppose I will get lucky and win one? To clean out the freezer I usually make gumbo or a braise of some sort (winter) or fried rice (summertime). Teensy bits of leftover protein (already cooked) go into quesadillas or on top of pizzas. I made this last week and remember hearing you mention it on Twitter on the same day! Guess everyone’s in the mood for jambalaya! Your version looks and sounds delicious — it’s fun to play around with it, isn’t it? 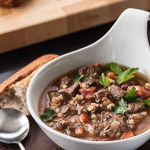 My favorite freezer-cleaner-outer meal is a good lamb stew… I can work through any cuts of lamb that have sat maybe a little too long in the freezer, as well as any reject veggies and containers of veggie stock from other projects. Add some aromatics and a bit of fresh herbage, and you can disguise a freezer meal any day! I usually make a quiche to clean out my fridge. You can pretty much put any kind of veggies or meat and cheese in it and it turns out good! My husband and I eat a lot of chicken and bell peppers so we always have a ton on hand. We like to make any variation of stir fry, fajitas, tacos, etc to clean out our fridge before the stuff goes bad. Easy & tasty! I incorporate just about anything into a stir-fry. And anything in the fridge that doesn’t play will with Chinese can be thrown into a pan with chicken stock and rice. I would make some kind of soup. That is always a good one to get rid of ‘stuff’ in the freezer or frig. Gotta admit it, jambalaya ranks right up there. That said, while some people make “all but the kitchen sink” soups, but I have a tendency to be terribly creative with pasta dishes… A few slices of corned beef in the freezer and some carrots and sauerkraut (or cabbage… or greens) in the fridge? How about a nice batch of reuben pasta? Thanks to everyone who entered! The contest is now closed. Check back in a few days for the announcement of the winner! My cleaned out freezer or refrigerator meal is left over yellow rice, leftover chicken and some black beeans with a prinkle of shredded sharp cheese. Guess what I am having tonight for dinner since I saw your delicious Jambalaya? I am having Jambalaya. Those shrimp look so tempting. I’m sure the dish was delicious. Oh bummer, I missed out. But congrats to the winner! That’s a great scale! 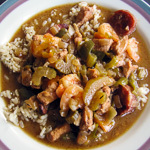 We were just talking about jambalaya last night and seeing your picture here is making me soo hungry! This sounds really tasty! I have been wanting to try jambalaya for a while now.